A capital campaign sometimes sends organizational leaders into writing a case for support and asking questions about the different pieces that are included. Leadership oftentimes discusses philanthropic or campaign publications and communications including brochures, newsletters and letters with beautiful layouts and designs. However, your leadership should start with the different components needed to take the publications to the next level, thus helping elevate philanthropy. This file is extensive and has all the foundational documents and narratives that help create the case for support. It includes the nonprofit’s major documents including the mission, vision, values and strategic plan goals. It is important to also include the nonprofit’s financial overview and any capital planning. These could be in the form of a narrative or via graphics. Programs and services should also be defined and their outcomes and impacts highlighted. Part of the Case Resource File should include information about how the nonprofit organization plans and evaluates its impact on the community and world. The Case for Support is central to all reasoning about your organization’s need for philanthropic support. 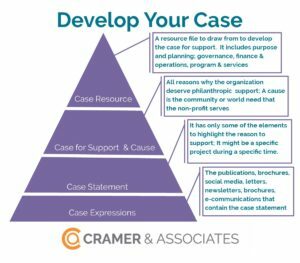 This is an extensive document and includes the major components from your Case Resource File written in a compelling and engaging way to attract donors to support the nonprofit. It should include head (fiscal and sustainable) and heart (emotion and connection) objectives for your organization. “The Case for Support is the best tool for making all the relevant points that will elevate your donor’s interest and passion. We often find when developing the Case for Support, many elements of the organization’s plan are reprioritized as we dig into the strategy and need. As the Case for Support is written, leaders often see the organization and its needs through an external lens that leads to a recasting of philanthropic priorities,” mentions Mike Schmidt, Executive Vice President & Partner of Cramer & Associates. A Case Statement is not as extensive as the Case for Support. It may only cover a specific area, project or program of need for the organization. Based on the audience, different parts of the Case for Support are pulled and used in the Case Statement developing the compelling story of need to attract philanthropic support. “Over the last 10 years, case statements have gone from lengthy narratives to highly colorful images and infographics. While it is a testament to the contemporary style of sharing information, it increases the importance of having a leader share the case and tell the story in person, adds Mike. Case Expressions are the letters, newsletters, social media posts, infographics, e-communications, presentations and in-person meetings that are developed and design that specifically asks for support. These elements turn your case for support into action. In closing, “It is important to remember that when you are creating your case, most philanthropic leaders will probably be reading at least three other cases the same week as they read yours. Make it memorable and have no more than three major points” emphasizes Mike. Spend some time gathering your organizations documents and conducting a review on the pieces you have complete and need to develop.